It’s Monday, Florida State fans. As you recover from Super Bowl Sunday and head back to work, keep it here for the latest in FSU athletics. The news and notes section of this post will be updated throughout the day. 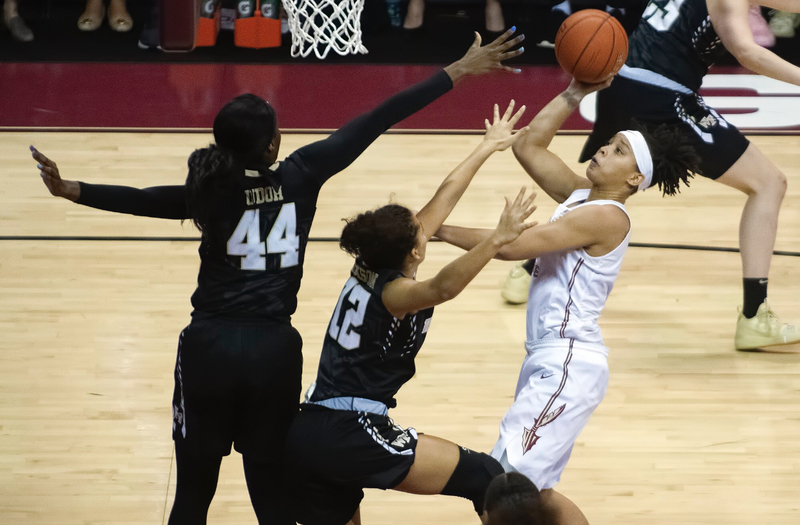 Florida State women’s basketball notched a third straight victory on Sunday with an easy 85-61 win over Wake Forest at the Donald L. Tucker Center. As a team, FSU shot 55 percent as a team and had five players score in double-figures in a dominating victory. Kiah Gillespie shot 9-for-15 from the field and finished with 22 points. Nicki Ekhomu finished with 17 points on 7-for-9 shooting to go with six assists. Nausia Woolfolk, Morgan Jones and Valencia Myers added 14, 12 and 10 points, respectively. Gina Conti finished with 19 points and six assists to lead Wake Forest. Up next for FSU is a home date on Thursday against an NC State team that suffered its first loss over the weekend. In addition to FSU women’s basketball, FSU women’s golf began the Northrup Grumman Challenge in California on Sunday. FSU women’s golf will continue the Northrup Grumman Challenge on Monday. The men’s team begins the Sea Best Invitational. FSU basketball rose three spots in the AP Poll.